And another baby makes six! 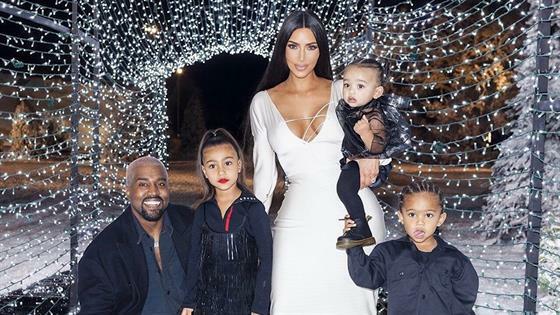 It was revealed this week that Kim Kardashian and Kanye West are expecting their fourth child via a surrogate. "The surrogate is well into the pregnancy," a source told E! News, confirming the exciting baby news. "She is due in May and everything looks good. Kim and Kanye have known for awhile and are very excited. They had one male embryo left and are thrilled it has worked out. Kim always wanted four kids and having two boys and two girls feels perfect." The insider added, "They were very happy with the entire experience the first time and are so grateful to have one more baby." The couple welcomed their third baby, Chicago West, via a surrogate in Jan. 2018. Kim and Kanye are also parents to North West, 5, and Saint West, 3. E! News has also learned that Kim and Kanye are using a different surrogate than the surrogate they worked with for Chicago's birth. An insider tells us that the original surrogate that carried Chicago got pregnant on her own and Kim picked a new surrogate over the summer. Another insider also shares with E! News that Kimye just recently began telling their friends about the baby news. "They just recently began sharing the news with friends that they were having a fourth. They've been so busy with their three kids and the holidays they haven't had a lot of time to do anything else," the source says. "Kim will have some sort of shower to celebrate. It's a different experience for Kim when she isn't pregnant. But she's happy she has been through this before and knows what to expect. She had such a positive experience the first time and is really thrilled to be able to do this again this way." During a March 2018 episode of Keeping Up With the Kardashians, viewers got to see Kim's first surrogate meeting her family for the first time. "So my surrogate is in town for a doctor's appointment, so I thought it would be an amazing time for her to meet my family but still not expose who she is to the world, just for her safety," Kim said on the episode. "This has been such a long journey for us and something that I wanted for so long and I share everything with my family." "This experience, going into it, I really didn't know what to expect, 'cause I don't really know anyone that's gone through this," Kim went on to share. "It was definitely not as easy as I thought it would be emotionally, but it's so worth it and our surrogate is such a nice person. My family absolutely loves her and I'm just so grateful."